A third of middle-class families would need to borrow to pay an unexpected bill of £500, according to a new survey. The YouGov poll for the Times found 31% of ABC1 workers, which includes junior managers and professionals, would struggle to pay a sum of that size. The figure rises to 46% for manual workers and the unemployed. Although inflation is currently low, many workers have not had pay rises for years. The Bank of England said last month that it expected inflation to increase in the second half of the year, which could put more pressure on some households. The survey of 1,648 adults across the UK was conducted by YouGov on 16 and 17 May. It found that 14% of those questioned could not pay a bill of just £100 without borrowing. Women were less likely to have spare cash than men, while almost half of those aged 18 to 24 would not be able to find £500, compared with 23% of those aged 65 and over. Many Americans are also in a similar financial position. Since 2013 the Federal Reserve has been asking US consumers how they would cope with a $400 (£276) emergency. This year 47% of respondents said they would have to either borrow, or sell something they owned to be able to find that much cash. 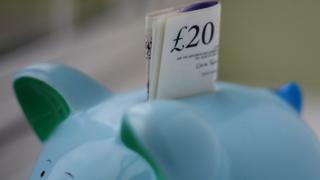 The Money Advice Service has found that four in 10 UK adults have no more than £500 in savings, while a survey by ING bank suggested that 28% had nothing at all in their bank account. Family debt stood at an average of £13,520 at the start of the year due to the availability of cheap credit, according to Aviva. The figure had jumped by £4,000 in just six months to the highest since the summer of 2013, the insurer said. The Aviva report suggested that the typical family had a savings pot worth £3,150. Martin Lewis, the MoneySavingExpert.com founder, recommended that families put aside enough cash to pay their bills for "at least six months". However, he admitted that would be difficult for many on low incomes. How much of a savings buffer do people need?